In this gear review, we look at ARQ Aero RhythmTrak, an innovative all-in-one music production and performance instrument developed by ZOOM in collaboration with Dubspot’s Adriano Clemente. ZOOM North America, the company behind an array of innovative recording devices, has announced the debut of the ZOOM ARQ Aero RhythmTrak. ARQ brings a completely new experience for music producers and performers revolutionizing the way they interact with music. The ARQ allows music producers and performers to create drum patterns, sequences, synth sounds, loops, launch clips, and control MIDI. Even more, its wireless Bluetooth Ring Controller allows musicians to escape the booth and move the music out in front of the audience. The ARQ consists of two powerful components – the Base Station (AR-96) and the detachable Ring Controller (AR-96c). ARQ can be used as a powerful and diverse standalone instrument. The Base Station (AR-96) houses 468 drum and instrument sounds, dozens of digital effects, and a powerful sound engine that includes not only 70 “one-shot” sampled waveform sounds, but also a comprehensive synthesizer to create one-of-a-kind sounds. Choose from 531 different oscillator types for sonic variety, and then add digital effects such as filtering, delay, and reverb, along with sound-shaping controls like envelope generators and stepped or smooth modulation. ARQ also allows you to create completely original loops from onboard sounds or patterns, or by capturing external audio via dual 1/4″ inputs. Up to 32 loops can play back simultaneously, forward or reversed, sliced, pitch-changed, and synchronized to the same tempo. The Ring Controller (AR-96c) communicates with its Base Station, as well as computer and iOS-based DAWs, via wireless Bluetooth LE. It has 96 velocity- and pressure-sensitive pads with aftertouch, and a built-in 3-axis accelerometer that generates MIDI control messages to change sounds and effects in real time. For the first time, musicians can visualize their music as a true loop, up to 5 parts at a time. ARQ supports both step and real-time sequencing, allowing users to change the timbre or note of each part with the touch of a button. Up to 32 parts can be played back simultaneously, and up to 400 patterns can be combined in any order to form a complete song, which can then be flattened into an audio loop that can be played back from a single pad—all without the use of a computer. Not only does ARQ allow you to create incredible drum parts and patterns, but you can also use the Ring Controller as a live instrument. Play it while mounted to the Base Station, or remove it to take your performance to the front of the stage. ARQ comes with a multitude of editable PCM drum and instrument sounds organized into 50 genre-specific kits, and you can also develop 50 kits of your own, complete with effects. 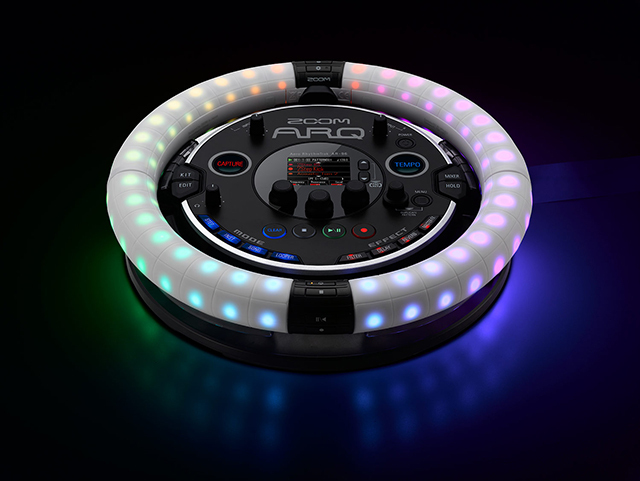 Once you perform with ARQ, you’ll never use another drum machine again. ARQ’s powerful sound engine offers 70 preset “one-shot” sounds—sampled waveforms that can be pitch-shifted as they are played over multiple pads—as well as an onboard synthesizer that allows you to build completely original timbres. Choose from 531 different oscillator types for sonic variety, and then add digital effects such as filtering, delay, and reverb, along with sound-shaping controls like envelope generators and stepped or smooth modulation. ARQ’s approach to sequencing allows you ti visualize your music as a true loop and is capable of sequencing up to 5 parts at a time. Individual patterns or complete songs can be constructed one step at a time or by recording a real-time performance with an onboard mixer that lets you set volumes, mute, and solo parts. Instruments can be assigned to single or multiple pads. Yu can create up to 3 parts at a time or play back up to 33 parts simultaneously. Also, the timbre or note of each part can be changed with the touch of a button. 400 patterns can be combined in any order to form a complete song, and then flattened into an audio loop that can be played back from a single pad—all without the use of a computer. ARQ allows you to create completely original loops from onboard sounds or patterns, or by capturing external audio. Set start and end points, change the pitch if desired, choose between forward or reverse playback, then assign each loop to a different controller pad. Up to 32 loops can be played simultaneously and synchronized to the same tempo. ARQ makes creating loops a lot more fun! Use the Ring for wireless control of all your MIDI instruments and devices connected to your computer. Its 96 pads are velocity-sensitive and can also send aftertouch (MIDI messages generated based on the pressure applied to the pads once they are being held down). The Ring’s onboard 3-axis accelerometer can be used to change sounds and effects in real time. Wave and tilt it to alter onboard effects parameters and to generate MIDI control messages. You can even link it to your digital mixing console and use the accelerometer to fly sounds around the room. ARQ utilizes wireless Bluetooth LE for low power consumption, giving you lots of performance time between battery charges. « Dubspot Winter Sale + New Course Dates Added: Save up to 25% on All Courses!